Charters available in Grenada starting December 2018 and anytime after. Grenada offers a year round fishery with a peak in the billfishing from December-April with a shot at a Grand Slam a very real possibility any day! Check the calendar at the bottom of the page for available dates. Email me (Captain Ricky Wheeler) at CaptainRickyWheeler@gmail.com or CLICK HERE to CONTACT ME with any questions you may have or to book a charter with me. We have two boats to offer in Grenada starting in November of 2018. See the boats and the trips we have to offer below. Please note that the trip rates below do not include the customary 15-20% tip for the crew. The crew works hard nonstop even before and after your trip and rely on their tips for income. Exile 65 – 65′ Custom built Paul Mann Sportfishing Boat – 6 passenger maximum – This boat was built to be a self sufficient fishing machine making it ideal for liveaboard trips in various locations throughout the islands. She has the speed to get you to the fishing grounds and the comfort to make everything about your trip enjoyable. $2800 Full Day Trip (8 hours – 7am til 3pm)***Best Trip to rack up the billfish releases and tangle with big tuna: If you want to see everything Grenada’s Bluewater has to offer then this is the trip for you. Billfish such as Blue Marlin, Sailfish and White Marlin are the target species on this trip, but we are always ready to go after the big yellowfin tunas when they show themselves. Mahi (aka dolphin fish) are a common by catch. Runs to and from the fishing grounds are usually 5-25 miles. Trip Includes: lunch, water, soda, beer, snacks. $1800 Half Day Trip (5 hours – 7am til Noon): Billfish such as Blue Marlin, Sailfish and White Marlin are the target species on this trip with a common by-catch of large yellowfin tunas and mahi (aka dolphin fish). This is a great trip if you don’t have a whole day to spend but want to your best chance at getting into some great fishing action that Grenada offers. Runs to and from the fishing grounds are usually 5-15 miles. Trip Includes: water, soda, beer, snacks. 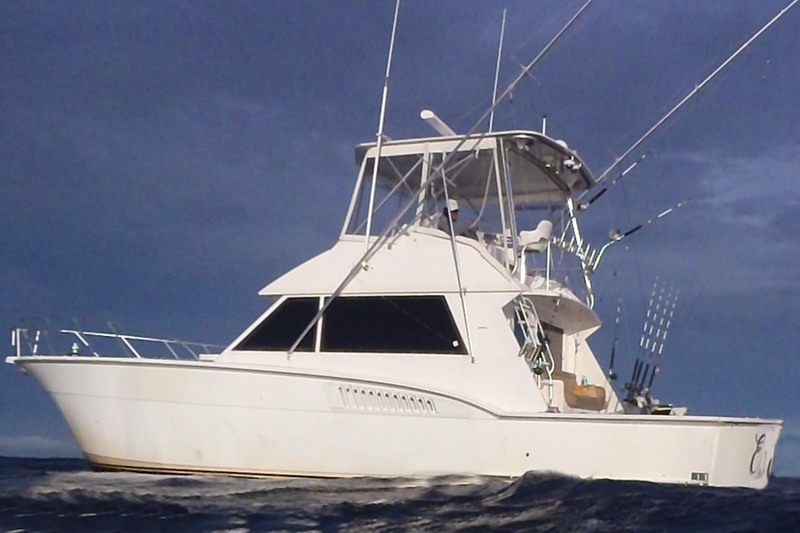 Exile – 45′ Customized Hatteras Sportfish – 6 passenger maximum – a classic sportfishing boat, this Hatteras is a great platform for fishing the Caribbean Islands. The addition of the mezzanine with the sofa seating makes it relaxing to be in the cockpit all day long. Solid, stable, and a fish catching machine; Exile is truly a legendary boat with well over a thousand billfish releases to her credit and counting. $2200 Full Day Fishing Trip (8 hours – 7am til 3pm)***Best Trip to rack up the billfish releases and tangle with big tuna: If you want to see everything Grenada’s Bluewater has to offer then this is the trip for you. Billfish such as Blue Marlin, Sailfish and White Marlin are the target species on this trip, but we are always ready to go after the big yellowfin tunas when they show themselves. Mahi (aka dolphin fish) are a common by catch. Runs to and from the fishing grounds are usually 5-25 miles. Trip Includes: lunch, water, soda, beer, snacks. $1000 Half Day Fishing Trip (4 hours – 7am til 11am and 1pm-5pm): This trip is meant to get you out there to the fishing grounds and gives you a chance to catch Blue Marlin, Sailfish, White Marlin, tuna, wahoo, and mahi (aka dolphin fish). Runs to and from the fishing grounds are usually 4-10 miles. Trip Includes: water, soda, beer, snacks. $700 Half Day Economy Trip (4 hours – 7am til 11am and 1pm-5pm): This trip is meant to get you out there for a half day on the water targeting whatever wants to bite from wahoo, kingfish, barracuda, tunas, mahi, sailfish and maybe even a blue marlin. Runs to and from the fishing grounds are usually 2-8 miles. Trip Includes: water, soda, beer, snacks . We will be running our trips out of Port Louis Marina located in St. George’s, Grenada. There are plenty of places to stay nearby, and it is only a 20 minute taxi ride from the airport to St. George’s ($25) making travel very easy. There are plenty of things to do in Grenada for people who don’t fish making it a great vacation destination all around. Grenada has amazing beaches, rain forests, snorkeling, scuba diving, and plenty more.